The summit’s outcome is unlikely to move North Korea closer towards elimination of its nuclear weapons program, and raises questions about the future U.S-Japan strategy towards the state. It also raises questions about the efficacy of Japanese Prime Minister Shinzo Abe’s diplomatic engagement with Trump up to this point. Have the numerous high-level meetings been effective in steering the American president, and if not, what options are left for Abe’s engagement with the United States on key issues? Since Trump and Abe’s Mar-a-Lago summit in mid-April, the two leaders have had multiple calls and an additional meeting in Washington, D.C. last week. Japan’s Foreign Minister Taro Kono met with U.S. Secretary of State Mike Pompeo in late May and in June, while Defense Minister Onodera and Secretary of Defense James Mattis met three times since the Mar-a-Lago summit. In these interactions, officials emphasized the importance of close coordination vis a vis North Korea to achieve total, verifiable, and irreversible denuclearization in the country. Japanese leadership also highlighted the importance of North Korea eliminating all ballistic missiles as part of denuclearization, and the need for North Korean to resolve the issue of Japanese abductees. Following the Singapore summit, the joint statement of Trump and Kim either ignored or only vaguely covered the issues of importance to Japan. 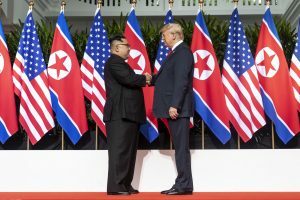 “Reaffirming the April 27, 2018 Panmunjom Declaration,” reads the statement, “the DPRK commits to work toward complete denuclearization of the Korean Peninsula.” According to the statement, the agreed upon outcomes will be further negotiated by Secretary Mike Pompeo and a high-level North Korean official at a later date. These negotiations may very well include stipulations that cater towards Abe’s Singapore summit wish-list—during the post-summit press conference Trump confirmed that he raised the issue of Japanese abductees with Kim—but, as with other long-term outcomes of this summit, only time can tell whether progress will be made. The post-summit press conference provided an opportunity for Trump to restore faith in his prioritization of the U.S.-Japan relationship, but instead, hints of his America First doctrine resurfaced. Despite Abe’s continued attempts to prioritize security within the U.S.-Japan relationship through high-level meetings and diplomacy, Trump continues asking Japan to “pay more” to support the alliance. Going forward, Abe will undoubtedly seek direct contact with North Korea to advocate directly for Japanese abductees and address Japan’s security concerns. Taking domestic politics into consideration, a meeting with Kim Jong Un coupled with progress on the issue of Japanese abductees could restore some of Abe’s popularity with the Japanese public. A potential summit could also add to his legacy as a leader thoughtfully engaged with the most important foreign policy issues of his time. Whether the Trump-Kim relationship continues to improve or deteriorates, Japan, as a major power in the region and one of the United States’ closest allies, needs to continue advocating for its priorities in relation to North Korea.